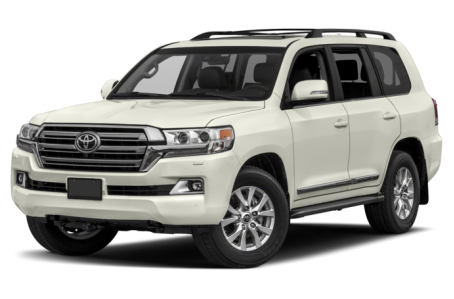 The 2018 Toyota Land Cruiser is the flagship SUV that seats up to eight passengers. It has a premium leather-trim interior, a 40/20/40-split folding second-row seat, and 50/50-split folding third-row seat. Maximum cargo capacity is 81.7 cubic feet with the second-row seats folded and the third-row seats removed. Under the hood, it is powered by a standard 381-hp, 5.7-liter V-8 engine mated to an eight-speed automatic transmission that produces 401 pounds-feet of torque.